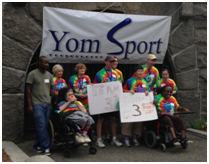 On Sunday, August 18, Greater Boston’s day of sports for adults with disabilities, Yom Sport, celebrated its 18th anniversary! It was a sea of tie-dye shirts and smiles as volunteers and adults with disabilities joined their teams to compete in sporting events. Participants competed in a variety of activities from soccer accuracy to relay races to golf and, of course, winning medals for their achievements at each station. On the Yom Sport webpage it says, “Yom Sport serves many purposes which include a place to make new friends, raise awareness, a chance to see similarities among people with different abilities, and a unique opportunity to gain a new perspective on one’s own life. Most importantly, we have a lot of fun!” This statement proved very true last Sunday athletes, volunteers, and family members came together to create a very special day of fun and competition. Everyone was extremely supportive of one another, giving high fives, hugs, and congratulations, as the athletes scored goals, worked together, and won medals. The mother of a participant of ten years, Esta Levine, said, “It’s wonderful. He loves being here! I look forward to this every year. Jonathan is really quiet but I see him looking around and I know he’s recognizing people-his friends. Many people participate in all activities. I bring him and I love watching all the people.” It was amazing to see the teamwork in every team, whether it was cheering on other competitors, working together for the win, or dancing to the background music. When asked what his favorite moment of Yom Sport was, volunteer Adam Amster said, “Watching the athletes having a success of any kind, even if it’s just competing and loving every minute of it.” Another volunteer, Pam Laufer said, “The whole thing; I’m having the time of my life. This is the most uplifting, positive, beautiful day I could ever want in my life. I wouldn’t want to be anywhere else in the world right now except here.” Some volunteers were team leaders or activity leaders and others worked one on one with a participant within a team and everyone was happy! All the volunteers were making connections with the participants and rekindling or creating friendships that will last for many years. One of everyone’s favorite moments at Yom Sport is when the athletes receive their medals. Jessica Cohen, a volunteer, said her favorite moment is: “The smiles on the athletes when they get their medals. It’s like the most glowing moment of the year. It’s what brings me back.” Yom Sport is a truly inspiring day of sporting events where adults of all abilities can shine and be winners!